Matthew Herper’s short article in Forbes includes this graph, which is a clear link to the efficacy of the rotavirus vaccine. You can access the full pdf from the New England Journal of Medicine here (also brief, with a better graph). How does the rotavirus infect its host? Why does diarrhea lead to death? What type of vaccine is this and how is it produced? What challenges are still to be overcome? The impact of vaccines, from Forbes.com. Click for the full article. With unfounded scare-stories and media hype comes anti-vax campaigning and a decline in vaccination rates. What are the ethical, economical and health issues related to this? How can it be resolved? Why fear of vaccination is spilling into the developing world, from the Guardian. 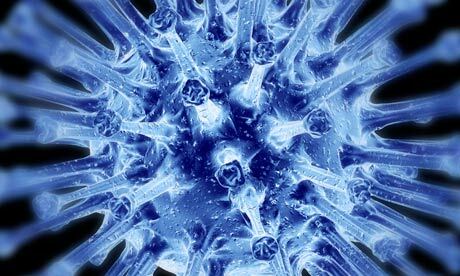 This is pretty awesome: Flu breakthrough promises a vaccine against all strains, from the Guardian. Read it and summarise how this team are working on their solution. History of anti-vaccination movements, from The History of Vaccines, The College of Physicians of Philadelphia. Can we stop polio for good? I wonder if you could clarify for me why, in slide 15, there is the distinction made between the MMR vaccine and the Rabies vaccine? In reading up a bit, I can’t tell the difference, and so I’m unclear about the idea of passive, artificial immunity. Could you or someone explain the rabies example? Thanks for the comment. The difference there is one of ‘in-case’ imunisation (vaccines) and ‘in-time’ treatment (direct injection of antibodies). Most of the vaccines we use are designed to protect us against infections should they invade. These are based on stimulating the immune system to provide its own immune response then latent memory cells (artificial active immunity). The *vaccine* to protect against rabies is very similar to the vaccine for MMR. However, if someone is not immunised against rabies, they may need *a treatment* – an injection of a large number of antibodies which is given in time if we’re bitten by a rabid dog or other animal. Rabies is fast and dangerous, and our body doesn’t have time to produce its own antibodies in sufficient quantity quickly enough to overcome the rabies virus. Instead, anti-rabies antibodies are produced in large volumes using the monoclonal antibodies technique. If they are needed, they are injected to the patient – bypassing the time taken for the body to produce its own – and stopping the virus hopefully before it is too late. This is passive artificial immunity, as our body has not had to produce antobodies itself. The pathogen is the disease-causing organism, such as the virus of bacterium. Antigens are proteins on the surface of pathogens, which the body recognises and being ‘non-self and triggers the immune response.